Here is our MapaWall Rosewood in an earthy space in Heist-op-den-Berg, Belgium. The client has placed our dark wooden map on a charcoal background in their unique living space. The map has been fixed in a central position above their sofa. All of our maps are placed a few centimeters from the surface. As you can see, this in turn creates a dark and prominent shadow behind our wooden map. Even on a dark wall this shadow is clearly visible and assists in generating depth and intensity. This MapaWall Rosewood has an oil finish. By treating the wood, you can achieve this deep and vibrant color. Rosewood is one of our darkest woods and with this oil finish you can get an even darker tone. By choosing this finish, the client has ensured our map effortlessly coordinates with the other elements of this space. Rosewood has unique red hue which is illustrated well in this image. The client has chosen the ideal wood for this space. Combined with the decorative grain, our MapaWall blends into this space magnificently. This space has a clear worldly interior design theme which has been exquisitely executed by this client. The client has chosen to incorporate red and pink into their colour scheme due to the red hues present in our MapaWall Rosewood. The most noticeable features of this room are the incredibly eye-catching decor. The client has chosen to decorate this space with large, striking ornaments. By designing the room in this way, the client has produced a space where you get the feeling of being transported to another part of the world! 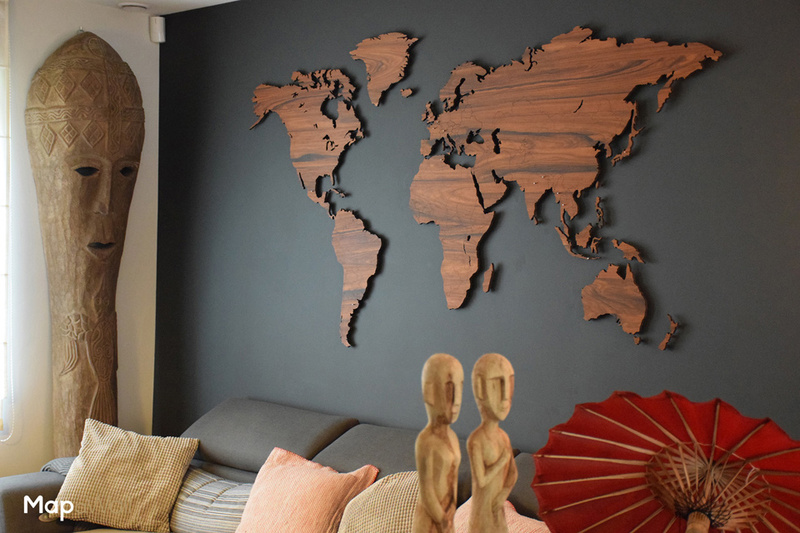 Our MapaWall Rosewood is an extremely exotic wood that works in accord with this decor and furniture.